Le Mont-Saint-Michel is an island commune in Normandy, France. Kick off your visit on the 23rd (Tue): look for all kinds of wild species at Mont Saint-Michel Bay, then take in the architecture and atmosphere at Eglise Paroissiale Saint-Pierre, and then contemplate in the serene atmosphere at Mont Saint-Michel. On your second day here, step into the grandiose world of Chateau de Fougeres, stroll the grounds of Cimetiere Militaire Americain de Saint-James, then take in the spiritual surroundings of Eglise Notre-Dame-des-Champs, then cool off at Alligator Bay, and finally don't miss a visit to La Grande Rue. 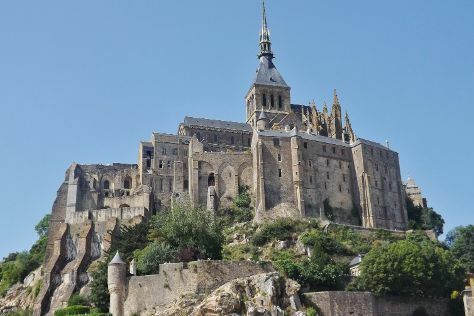 Make your Mont-Saint-Michel itinerary with Inspirock to find out what to see and where to go. If you are flying in from Israel, the closest major airports are Dinard-Pleurtuit-Saint-Malo Airport, Rennes-Saint-Jacques Airport and Deauville-Saint-Gatien Airport. In April, plan for daily highs up to 17°C, and evening lows to 6°C. Finish up your sightseeing early on the 24th (Wed) so you can travel back home.